On a clear winter day in the heart of Montreal, two identical girls stood at the top of a hill on ponderous seven-foot hickory skis and dreamed of flight. It wasn’t the first time. In 1933, the eleven-year-old twins were already veteran skiers. Rhoda and Rhona Wurtele had been strapping their brothers’ skis to their leather lace-up boots and skiing the Gully, a half-mile slope down Westmount hill, since they were five years old. The hill was a short walk from the front door of their family’s Elizabethan home, and they had hiked the distance many times. The Gully was a bumpy, two-tracked piste that seemed tailor-made to train skiers for any eventuality. Today the track has become Summit Circle, a toney street winding past magnolias and fortresses of the wealthy, a place where people like to think they can keep the unpredictable at bay. But the twins’ weren’t thinking of any of that, and especially not of the future. The Gully was only the means to an end. And the end was a massive wooden structure that rose from the mountainside: beside the junior ski jump, where skiers took off from a jump built into the hill, towered the 125-foot-high senior ski jump. The jumps had the allure of forbidden fruit. The twins’ older brothers, future air force aces Edgar and George, both regularly flew off the end of the things in the same long, four-inch-wide glorified barrel staves with four grooves on the bottom. It was a wonder they got any air at all. But professional male jumpers could wing it for 148 feet before gravity remembered them. Upon landing, skiers had to turn fast so they wouldn’t jump again over the big snowdrift at the end of the run—and come down through the roof of a tennis clubhouse. That afternoon, watching Edgar soar off the rickety jump, Rhoda and Rhona asked each other if today was the day to make the leap, take that jump. That was the danger and delight of being twins: you always had an alter ego to push you further or pull you back. They soon found themselves at the top of the junior jump and, before they knew it, off its ramp. It is neither esoteric nor complicated, the feeling that comes from ski jumping: it feels as if you can fly. Granted, it lasts only two or three seconds before the Earth comes rushing up to take you back in her arms. Except that those two or three seconds are forever. One after the other, Rhoda and Rhona landed on their feet. Then they immediately cornered Edgar and told him about their first taste of flight. “That was nothing,” he replied, conscious of his brotherly duty to tempt and challenge. “You don’t get to brag until you’ve gone over the senior jump—and are still able to speak after you hit the ground.” When were the twins going to try that? Obviously, though older and wiser, Edgar still didn’t understand his little sisters. They could resist everything except temptation—the temptation of a challenge. So they answered, simply: “Today.” And as he saw his sisters climbing up to the launch area, he considered that he might be the first one called in for questioning if one of them broke a leg. Or a neck. Now he had to stop them. “It’s icy today. Not the best day to do it,” he tried. The Côte des Neiges senior ski jump was nailed atop a rickety wooden scaffolding that creaked and shifted in the frigid wind. It was built by Aleksander Olsen, a Norwegian immigrant carpenter who was six times Canadian champion in ski jumping (his son Kaare also jumped and skied; today he is a member of the Rhona and Rhoda’s Twinski Club). Jumpers reached the top by climbing stairs from the base. The twins clutched the railings, lugging their brothers’ skis. Up top, where February blew hard, you could see the entire city spread out below. One million people at your feet, the three hills that rise in mid city dusted with powder around you. According to Quebec’s greatest ski pioneer Herman “Jackrabbit” Johannsen in 1928, Montreal was “unique in being the only place on the continent where good skiing can actually be enjoyed in the heart of a great city.” Despite the crushing Depression, there was a lot more to be enjoyed in the city too—if you looked closely, you could also spot more than two hundred gambling joints and a bevy of brothels on de Bullion Street. On the roads into town, streams of cars and trains brought Americans fleeing Prohibition. Going the other way across the border were bootleggers like the Bronfman family, feeding the same need. Mayor Camillien Houde, the flamboyant eccentric who was in and out of office for twenty-eight years, was trying his best to keep the city on its feet. From the top of the ski jump too, you looked directly down on what less adventurous souls might have considered a warning: Mount Royal Cemetery, already jam-packed, but always with room for one—or two—more foolhardy souls. No woman under the age of eighteen had ever flown off that jump before; few women of any age had. The Montreal Star later said they were “the only girls to do it in 15 years.” And yet their glorious career in ski jumping came to a crashing halt one day. Someone had suggested they go off the jump together, holding hands, during the George Washington tournament. The twins had thought it a smashing idea. But someone, perhaps the Montreal Ski Club, or the newspapers, or a worried neighbour, had called their parents and let the secret out. Their father, John Stone Hunter Wurtele, was suitably impressed (he even sent a friend to record the event with a 16 mm movie camera), but Mother thought it wouldn’t be a good idea for her little birds to jump out of the nest in such a spectacular fashion. “It isn’t a ladylike sport,” she said. After those heady flights, the impact of that forced landing was harder than any other. That these kinds of limitations are still placed on women may not be surprising to anyone born before 1960. Not too long ago, girls were given the same excuses when they wanted to play Little League baseball; the women’s marathon wasn’t added to the Summer Olympics until 1984 because officials still believed women wouldn’t be able to handle it. Even before Rhona and Rhoda got to an age where they would encounter these limitations, they had already seen their older sister Jean held back from her passion. A natural dancer who in the 1930s performed at His Majesty’s Theatre in Montreal and who at the age of eighty could still kick her leg above her head, as a girl Jean was stopped from pursuing a career in the art. “Ladies didn’t do that kind of thing,” says Rhona. Jean certainly seemed psychologically fragile. When she was only fifteen years old she suffered a nervous breakdown. “She just came downstairs one day and wouldn’t talk,” says Rhona. “It was a very difficult situation because nobody really knew about these things. The neighbour told Mom that she thought Jean was doing too much, because she used to get these nosebleeds and things, and cry over her homework.” Yet Jean’s misfortune led to a winter-long holiday for the twins; their mother packed up all three girls and went to the family’s second home at Acton Vale for the season, taking the twins out of school. (A short while later Jean would become one of the first people in North America to receive electric shock therapy when the European neurologists who developed it toured to promote the method. “It worked—to a degree,” says Rhona.) Blissfully unaware of the serious problems around them, the young girls revelled in their freedom, building forts, skiing cross-country and generally getting into as much mischief as they could find. Looking back, the twins acknowledge they were lucky; they were privileged. Not every young girl had the chance to be a carefree child in the Depression. Back in Montreal, a third of the work force was unemployed. The majority of women, kept out of paying jobs in the best of times by their supposed frailty (even though they did hard physical work at home), now had even less chance; many made sure to take off their wedding rings lest their employers fire them so their jobs could go to men. But the twins’ family was well off, and Hunter Wurtele, a breadwinner whose job was not at risk, could afford to send his wife and children away for the winter. Years later, when they were young women and their work schedule didn’t jibe with their skiing schedule, it was an easy decision: quit work. Influenced by that early, invigorating taste of absolute freedom, the expectation that they could do what they wanted, when they wanted, would stay with Rhona and Rhoda forever. For they not only had freedom in their childhood to be tomboys, and freedom from financial worry, they also had the security of each other. Rhoda and Rhona, despite their penchant for wild flights, were good girls. That day when they were stopped from soaring off the ski jumps, they listened to their parents. “We haven’t tried it since,” Rhona says today. However, their parents had said nothing about racing downhill. And so began a double career that would help revolutionize women’s sport in North America. In a few years, the twins would go further and faster on skis than anyone else had before, beating the best male skiers of their day. 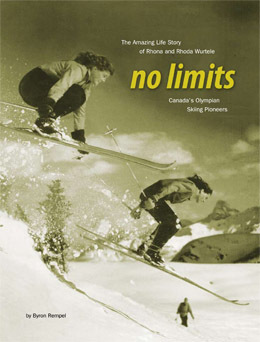 Rhona became the first Canadian skier to hold both American and Canadian national championships at the same time; the twins were the first and only women with Canada’s first true Olympic ski team; Rhoda was the first North American woman to place in the top three in a European Kandahar event; they jointly won the Athlete of the Year award. “Canada’s Terrific Twins” would go on to be featured in Life magazine, the Saturday Evening Post, Time, Chatelaine, Maclean’s and the New York Times—they would even be drawn up in a True Picture comic book during wartime, which otherwise told stories of heroic soldiers battling Nazis. The girls would have loved to see stories about themselves as heroic fighter pilots too, but that proved to be a barrier even the twins couldn’t surmount. The two skiing pioneers had carved an easily identifiable trail for others to follow. Canadian women’s skiing is directly indebted and linked to them, from Lucille Wheeler, Anne Heggtveit, and Nancy Greene, to today’s World Cup championship–winning women’s ski team. Even when the twins were no longer racing, their influence was felt: in 1959 Rhoda managed and assistant-coached the very first National Ski Team that Canada sent to Europe for the World Championships. It is no coincidence that Canada’s wins in the Olympics and world championships have largely been in the women’s division. Today, seventy years later, Rhoda and Rhona are still propelling themselves through the air. Within the last few years they have gone heli-skiing, bobsledding, paraponting, even bungee jumping. Always ladies, however, for the most part they stay off the ski jumps. 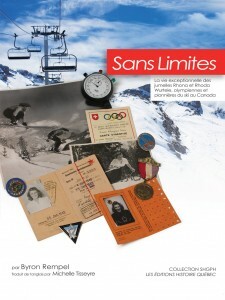 La vie exceptionnelle des jumelles Rhona et Rhoda Wurtele, olympiennes et pionnieères du ski au Canada.